On October 30, 2013 the U.S. Department of Justice (DOJ) announced the biggest immigration-related violation fines ever issued, fining IT services giant Infosys Limited (INFY) $34 million. This is only the latest indication that the DOJ is cracking down more frequently and more severely on immigration and work authorization violations. Infosys, which is the second largest employer of H-1B visa holders in the United States, is an Indian technology, consulting, and outsourcing company. Not many details of ICE’s I-9 audit of Infosys have been revealed until the DOJ’s October 30 press release: “Infosys failed the maintain I-9 records for many of its foreign nationals in the United States in 2010 and 2011 as required by law, including widespread failure to update and reverify the employment authorization status of a large percentage of its foreign national employees.” The audit revealed “more than 80 percent of Infosys’s I-9 forms for 2010 and 2011 contained substantive violations.” (Each one of these errors warrants a fee of at least $935.) In addition to paying heavy fines, Infosys is required to undergo additional third party I-9 auditing one and two years after the settlement. 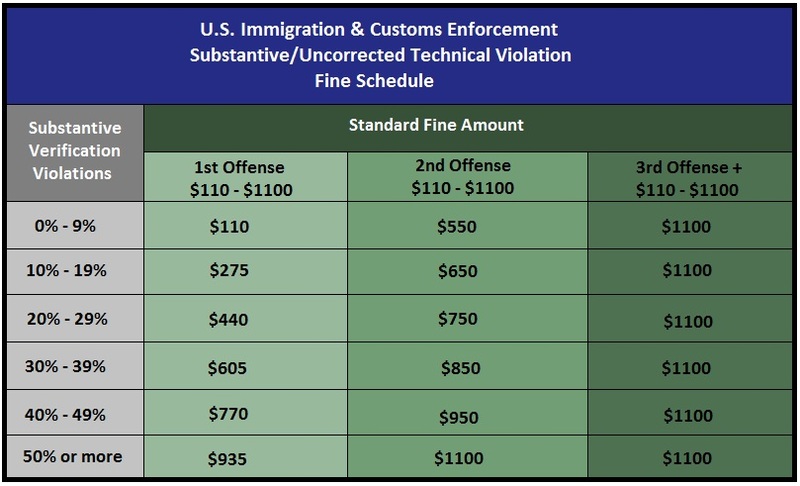 Fines can also be increased or decreased based on aggravating or mitigating factors: business size (+/-5%), good faith (+/-5%), seriousness (+/-5%), unauthorized aliens (+/-5%), history (+/-5%), and cumulative adjustment (+/-25%). Infosys’s fines serve as a clear reminder to employers of all sizes that risking non-compliance with employment and immigration regulations may not pay off long-term. All employers should review internal practices and hire legal counsel to ensure I-9 compliance in order to avoid paying the price later on.